This quick and easy, meat-free meal takes only 30 minutes to cook. Preheat the oven to 220°C, gas mark 7. 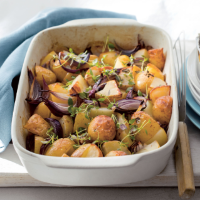 Place the potatoes and onions in a roasting dish with the thyme leaves, oil and seasoning. Roast for 30 minutes until tender and golden. Meanwhile, gently heat the ricotta and Gorgonzola cheese together in a small pan for 2-3 minutes. Add some seasoning to taste. Scatter the potatoes and onions with extra thyme leaves and serve with the sauce for drizzling. Delicious with roasted cherry tomatoes and salad leaves.